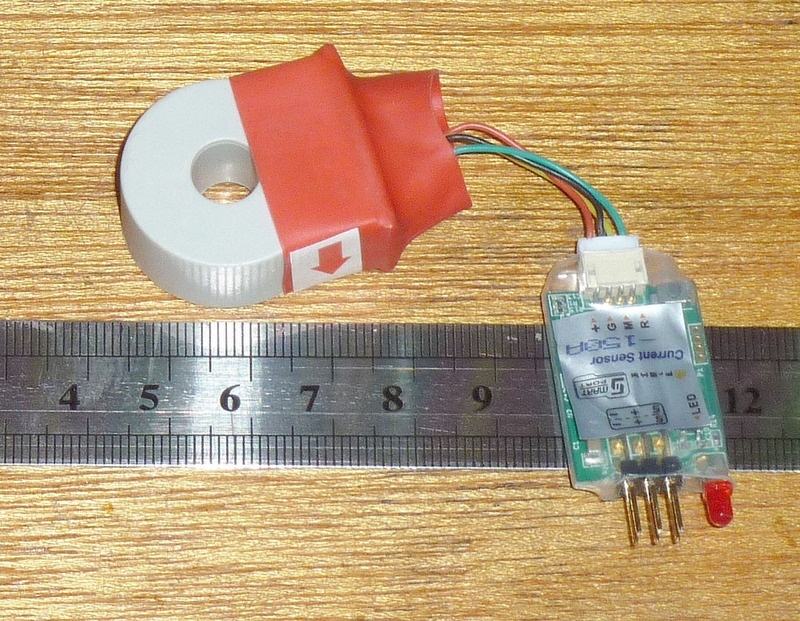 FrSky sells two current sensors, 40A and 150A. I hope they introduce one in between. 40A is a bit low for anything other than small and medium models. 150A is over the top for all but large and EDF models, and it has to be threaded on to the red ESC wire so requiring unsoldering the connector. It’s probably best to make up a special lead with XT90 connectors on each end. The 40A one has male and female XT60 connectors as you see from the picture. OpenTx has a very clever telemetry function called Consumpt. This takes the current (Curr) from a 40A FrSky current sensor, and presumably time from its clock, and calculates how many mAh of energy have been used. It removes the guesswork involved in relying on the varying voltages from a lipo sensor. However only the 40A version reads the battery voltage as well. If you want a voltage reading, for the 150A you would need also to have a lipo sensor to give the data item Cels. You can calibrate both Curr and VFas (battery voltage). This involves using a multimeter to read the true current and voltage and comparing them with the values shown in telemetry. If either is different, you open the Edit screen for the datum and enter a Ratio to correct the difference. For example the telemetry shows 22.5V and the meter shows 23.6V. The ratio is 23.6/22.5 or 1.05. For the record the full-throttle current was 37A on the Zippy and 39A on the Panther. That was nearing the limit for the device and it was only a Tundra motor running on 3S with a 12x6 propellor. However the person who wrote the OpenTx code seems to imply that the sensor will take higher currents. The results are pretty consistent but show a lower %age than that calculated by Consumpt especially towards the end of the ‘flight’. I checked my battery meter against another to see if it might be reading incorrectly. It does give a lower % reading than my iSDT charger when I connect the batteries after a flight, though slighly higher that the second meter. We must remember that none of these devices are calibrated test instruments. They are much too cheap for that. They are probably 10% tolerance What the tests show is that this method of monitoring batteries is reasonably accurate, and will help prevent battery damage and dead-stick landings. It is a little larger and heavier than the 40A but not much. It threads on to the red lead from the battery to the ESC. The arrow must point from the battery. Remember current is conventional current from + to -, rather than electron flow. 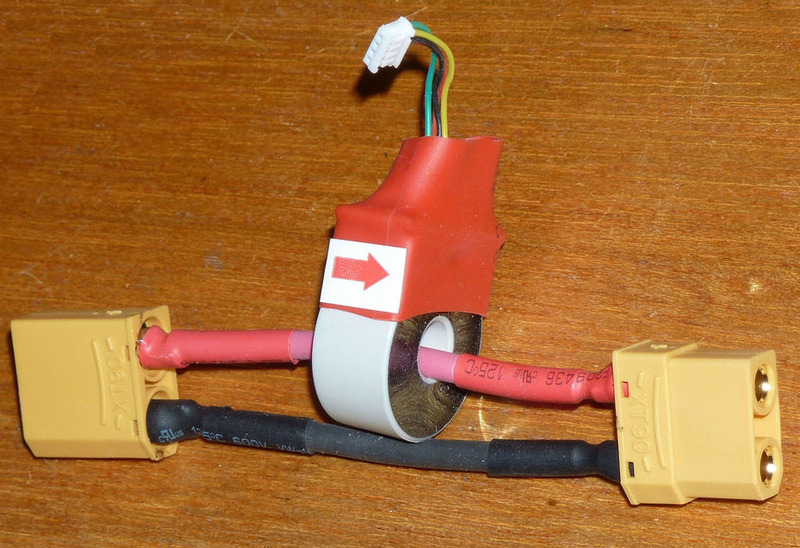 Here are pictures of the sensor and an XT90 12 awg lead I made up for it. There is more than one way, apart from the display on your telemetry screen. The simplest would be to read out the mAh used when energy reaches a low level. Set a Logical switch to switch on when mAh reaches 1500 in the above test case. That will switch on a Special function that reads out the value every 10 seconds. You would need to enter a suitable value into the Logical switch code line for each model’s battery size. Or you could simply read out the mAh every twenty seconds throughout the flight..
For more information and full manual see www.peterscott.website under Flying.